Damage prognosis is a natural extension of damage detection and structural health monitoring and is forming a growing part of many businesses. This comprehensive volume presents a series of fundamental topics that define the new area of damage prognosis. Bringing together essential information in each of the basic technologies necessary to perform damage prognosis, it also reflects the highly interdisciplinary nature of the industry through the extensive referencing of each of the component disciplines. 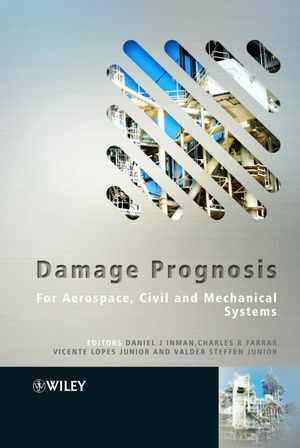 Taken from lectures given at the Pan American Advanced Studies Institute in Damage Prognosis sponsored by the US National Science Foundation in cooperation with Los Alamos National Laboratories, this book will be essential reading for anyone looking to get to grips with the fundamentals of damage prognosis. Presents the 'ground rules' for Damage Prognosis. Deals with interdisciplinary topics: rotating machines, aerospace structures, automotive components and civil structures. Covers essential technical material: equations, graphs and plots, tables and photographs. Offers additional material from the associated workshop on an active web site. Daniel J. Inman; Director, Center for Intelligent Material Systems and Structures.Since 1980, he has published five books (on vibration, control, statics, and dynamics), eight software manuals, seven book chapters, over 160 journal papers and 300 proceedings papers, graduated 35 Ph.D. students and supervised more than 55 MS degrees. He is currently Technical Editor of the Journal of Intelligent Material Systems and Structures (1999-2004), Technical Editor of the Shock and Vibration Digest (1998-2001), and Technical Editor of the journal Shock and Vibration (1999-2004). Charles R. Farrar, MS T-001, Los Alamos National Laboratory. Farrar is President of Los Alamos Dynamics. He is an expert in structural health monitoring and in technologies for detecting changes or damage in complex mechanical systems, ranging from bridges to nuclear weapons. He has authored dozens of papers and conference reports and has served as an editor for the International Journal of Structural Health Monitoring and the American Society of Mechanical Engineers Journal of Vibration and Acoustics. Farrar was instrumental in the recent establishment of the joint Engineering Institute for educational collaboration between the Laboratory and the Jacobs School of Engineering at the University of California, San Diego. Vicente Lopes Junior, Director of the Faculty of Engineering of Ilha Solteira, UNESP, Universidade Estadual de São Paulo, Brazil. Valder Steffen Junior, Federal University of Uberlandia, School of Mechanical Engineering, Campus Santa Mùnica, Brazil. 1. An Introduction to Prognosis, (C. R. Farrar, N. A. J. Lieven and M. Bement). 2. An Overview of Modeling Damage Evolution in Materials, (T. Williams and I. J. Beyerlein). 3. In Situ Observation of Damage Evolution and Fracture Toughness Measurement, (J. E. P. Ipina and A.A. Yawny). 4. Predictive Modeling of Crack Propagation Using the Boundary Element Method, (P. Sollero). 5. On Friction Induced Non-Ideal Vibrations: A source of Fatigue, (J. M. Balthazar and B. R. Pontes). 6. Incorporating and Updating of Damping in Finite Element Modeling, (J. A. Pereira and P. M. Doi). 7. Model-Based Inverse Problems in Structural Dynamics, (V. Steffen, Jr. and D. A. Rade). 8. Structural Health Monitoring Algorithms for Smart Structures, (V. Lopes, Jr.). 9. Uncertainty Quantification and the Verification of computation Models, (F. Hemez). 10. Reliability Methods, (A. Robertson and F. Hemez). 11. Lamb Wave Methods in Structural Health Monitoring, (C. Cesnik, and A. Raghavan). 12. Structural Energy Flow Techniques, (J. R. F. Arruda). 13. Impedance Based Structural Health Monitoring, (G. Park and D. J. Inman). 14. Statistical Pattern Recognition Paradigm Applied to Defect Detection in Composite Plates, (H. Sohn). 15. Sensing and Data Acquisition Issues for Damage Prognosis, (C.R. Farrar, P. Cornwell, N. F. Hunter, and N. A. J. Lieven). Chapter 16. Design of Active Structural Health Monitoring System for Aircraft and Spacecraft Structures, (F.-K. Chang, J.-B. Ihn and E. Blaise). 17. Optical Based Sensing, (M. Todd). 18. Prognosis Applications and Challenges, (D. Adams). 19. Prognosis of Rotating Machinery Components, (M. Roemer and B. Marshall). 20. Application of Simplified Statistical Models in Hydro Generating Units Health Monitoring, (G. C. Brito, Jr.).